PSALM 83, The Missing Prophecy Revealed presents the reader with an abundance of important prophetic information. It is a compilation of over eleven years of specific biblical examination that was prompted by the terrorist attacks on September 11, 2001. Initially, some of this research was published in the summer of 2008, in my book Isralestine, The Ancient Blueprints of the Future Middle East. Isralestine explored in significant detail, the prelude, episode, and aftermath of the epic Psalm 83 Arab – Israeli war, and hypothesized that Israel would win decisively and subsequently succeed in becoming a greater and safer Jewish state. 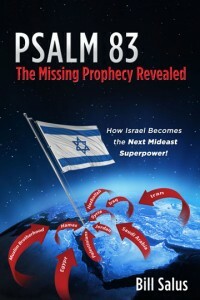 The book also theorized that the Psalm 83 prophecy appears to be an imminent event that should find fulfillment before the infamous seven – year “Tribulation Period” commences. Moreover, Isralestine explained why it was probably an entirely different event than the much popularized prophecy described in Ezekiel 38 and 39, commonly called the Gog of Magog Invasion. Due to Isralestine’s comprehensive look at Psalm 83, which was a relatively unexplored prophecy up to that point, it caught the positive attention of many of today’s top Bible scholars. 1. Psalm 83 was merely an imprecatory prayer of lament concerning all of Israel’s historic enemies. 2. The Psalm found historical fulfillment in the Old Testament, namely in 2 Chronicles 20. 3. The Psalm prophecy found fulfillment in the Arab – Israeli wars of 1948, and / or 1967. 4. Psalm 83 is not a separate prophecy but is one and the same with Ezekiel 38. 5. Psalm 83 is part of the Armageddon scenario that finds fulfillment in the Tribulation Period. As the table of contents reveals below, PSALM 83, The Missing Prophecy Revealed addresses all of the above, and so much more. Chapter 5- Psalm 83 or Ezekiel 38: What’s the Next Middle East News Headline? Chapter 11-	Who-domites? Who Are the Edomites Today? Appendix 2- Psalm 83: Has It Found Final Fulfillment? Appendix 3- Those Surrounding Israel to be Devoured! Appendix 4- Is Ezekiel’s Army About to Face-Off with the Arabs? Appendix 6- Israel Strikes it Rich Someday! Appendix 7- Is the Church Identified in Psalm 83? Appendix 9- Is Egypt in Psalm 83?